This entry was posted in Recent Posts and tagged Art, Audrey Dawn, Life, Nature, Photography, Poetry, Sky. Bookmark the permalink. Magical lines: “Whatever I need / I daydream / Artistically allowed”. I hope you’re having a wonderful Sunday! I do like a bit of magic, B. My Sunday is cold and rainy, but it is relaxing as well. My hope is that your day has brought you a smile. I’m smiling now, yes. Thank you 🙂 Stay out of that rain. Don’t get too wet! Good. I love your smile. I will try and stay dry!! Haha. Yum! The positive spin is always your approach and I adore that about you. Thanks for the laugh. Love the pic. I remember being 5 years old and being told by my mother that God sat on one of those clouds. I rushed outside to look at the sky. Thank you, Monsieur, for sharing a part of you with me. ♡ It is the end of the day and with your comment my choosing to post this picture finally feels right. I love the part about whatever you need you daydream. That’s tops. Thank you, Duketh. Doesn’t get much accomplished, but it is fun. You’re tops. Well, I don’t know…doesn’t daydreaming help with all sorts of things? Yes, it does, and you’re correct. I’m just being a brat lately. Sorry. You know I love daydreaming. It can help. I think maybe I am, too. No. I’m just kidding. We both know it’s my fault. This one’s a beauty, Audrey. And oh, for clear blue skies such as this! 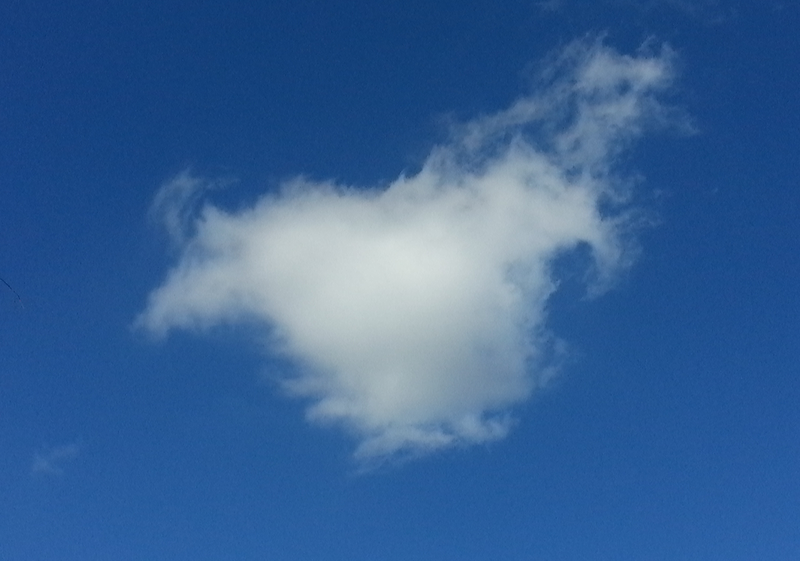 I see a dragon in this cloud, or perhaps a teapot, but I like your interpretation better!! Ha. I see both! Very nice, Debbie. You’re really great at this. 🙂 Hope you’ve enjoyed your day. When my boys were younger, they always seemed to see clouds shaped like Pokemon. Never saw it myself, but glad they had some imagination. The world of the mind can be quite exciting, Aud. When expressed properly, that is. Well done. I love looking at clouds and thinking about what a particular one looks like. Sometimes I create a story about it in my mind haha.